Mutton aka goat meat is classified as 'red meat' even though mutton fans claims it as healthier. It’s consumed widely in Middle East, Northern Africa and Asia. Mutton stew is a delicacy served with laced crepes during Christmas and Easter feasts in Christian families in Southern India. I remember my dad used to buy mutton during the weekends when we were in North India, where you get the baby goats that are claimed as very tastier. I was never a fan of mutton. My hubby was neither a fan. So I refrained from making mutton curry at home. It was sometime during my pregnancy with my elder son, I started to like the spicy mutton curry my Mom specially makes for me during the occasional visits. But my taste for mutton subsided very soon due to my bad experience with cooking this meat. Every time it resulted in chewy stringy piece of meat due to lack of availability of good baby goat. So I stopped buying it and my kids never developed a taste for it. I would be an exception to the non-vegetarians, because, I never had heard from an Indian that they dislike Mutton. I remember my grandma used to put papaya pieces while cooking the mutton which was then taken out when the curry was ready. But I never knew the purpose of it; I always wondered what was the point of adding papaya to the curry. Now I know that it was used as the meat tenderizer. The key to make a good mutton curry depends on the quality of the meat. Meat from young goats and meat from young male goats won't have a leafy smell and they cook faster. Older meat is best cooked through slow, moist cooking which takes more time to cook. Pieces with thigh bones enhance the flavor and juiciness of a good mutton curry. Knowing the tips/trick to make a good mutton curry really helped me to experiment with the mutton curry that I prefer to eat. Last Saturday I was determined to give my Mom's recipe a try with few changes that I thought would enhance the flavor to our liking. I have to say, the curry imparted the aroma that would have tickled the palates of any mutton lover even though I thought I should have cooked the mutton for couple more whistles in the pressure cooker to get a little more soft meat texture. When I was making the curry, my elder son Nathan was home and he was very much pleased with the aroma of the curry and he tried the gravy. He gave me a thumps up, which is hard to get from him. Since I got the confirmation from him, I was confident to do a post on my Experimental Mutton curry. So I pulled my camera and clicked few shots for the post. This mutton curry had changed my attitude towards mutton and things are changing in the Thomas family now. The younger ones still gave a big NO to the curry even without trying. But I am sure I can change their attitude towards mutton by making delicious mutton curry. Wash the meat thoroughly and drain. I add some lemon juice and salt while washing the meat to remove any smell. Now add the lemon juice, salt, pepper powder and turmeric powder to the meat pieces and mix well. Cover and refrigerate for minimum 1 hr. In the pressure cooker, splutter 1/4 tsp. of fenugreek seeds in 2 tbsp. of oil and add dry red chili on low heat. Once the red chili starts to change color, add the caramelized onion paste/the sliced onions with salt. 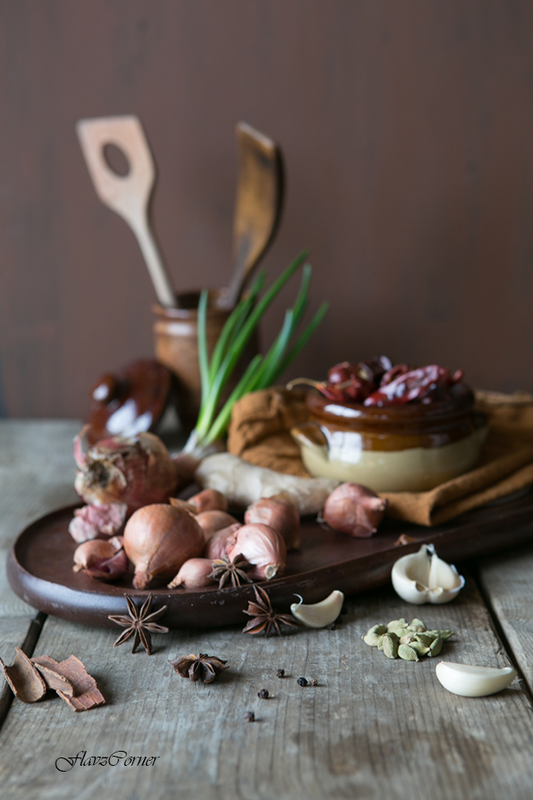 If using caramelized paste, just sauté for 1 minute, else cook till the onions starts to become translucent. Then add the ginger garlic paste and turmeric powder; cook till the raw smell goes. Add cubed potatoes and carrots. Sauté for a minute. Then add the marinated meat the pressure cooker and cook for 2 to 3 minutes. Add 2 1/2 cups of water. Close the lid of the pressure cooker and cook till 6 whistle blows. Once the pressure subsides, open the lid and check the texture of the meat. If the meat is still tough, cook for couple more whistles. Make a paste of chili powder, Kashmiri chili powder, coriander powder, garam masala ,asafoetida powder by adding 1/4 of water to the mix. Heat one 1 tsp. of oil in a non stick pan, add the masala paste to the hot oil and cook by stirring continuously on low heat for 3 to 5 minutes till the raw smell is gone. Add tomato paste/chopped tomato to this and cook for another minute till the paste comes together a big lump. Turn off the flame and add the masala mix to the cooked meat along with a sprig of curry leaves in the pressure cooker. Add one bay leaf; secure the lid and cook till 2 whistles blows. Turn off the flame and let the pressure subside. Mean time prepare tadka by spluttering the 1/2 tsp. of mustard seeds in coconut oil, add the crushed coriander seeds, sliced shallots, red chili, fresh ground pepper. Sauté under low heat till the shallots become golden brown. Turn off the flame and add the curry leaves. Transfer the mutton curry to the serving bowl and add the tadka above it. Serve the mutton curry with Kerala Porota, rice or Indian flat bread like Roti or Naan. Since mutton/goat meat takes longer to cook, it is always better to add a meat tenderizer like papaya pieces or papaya paste. Alternatively you can marinate the meat with lemon juice or yogurt. It is advantageous to use a pressure cooker for this curry, otherwise you may have to slow cook the meat for at least an hour to get a tender texture. You can add more water to the curry per your desired consistency. I prefer thick gravy than runny gravy, so 2 1/2 cups of water was adequate to attain the thickness. I used coconut oil for making the seasoned garnish/tadka which imparts the authentic aroma and taste of the Kerala style curry. So I highly recommend the tadka made in coconut oil for this curry. You can use tomato paste or fresh tomato in this curry. Caramelized onion paste and tomato paste helped me to attain the thick consistency for the gravy. I wish I ate mutton! This looks so delicious and I want to dive into that gravy. Beautiful styling, Shibi. Thanks Angie!! I know it is an acquired taste. Thanks Remya!! 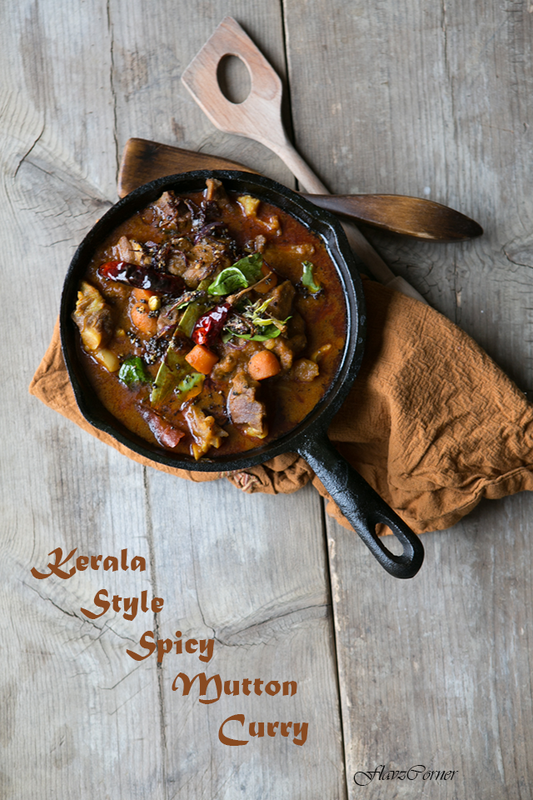 Its true that we Keralites are fond of Spicy curries. Thanks Shazzy for visiting and commenting! Hope to see you more often. spicy and delicious curry...Me & my hus are not a big fan of mutton,recently I have started trying this at home..will try sometime,lovely clicks!! Yeah, we were not very fond of its texture either. As I started cooking it more, we are getting the hang of it now. A spicy based curry will change the outlook of mutton. Thanks Anu for your lovely comment! The beautiful brown gravy looks really yumm to have with nice palappam or even bread even though I am do't eat mutton. I hear the mutton we get here is young of sheep not goat if we are not specific about it and that alters the taste entirely it seems. Getting thumbs up from kidoo is the most un biased opinion I always look for. Nice to know u guys have started liking it. We are not big red meat eaters. So this was another option to beef. But my attitude towards Mutton is changed by this curry. 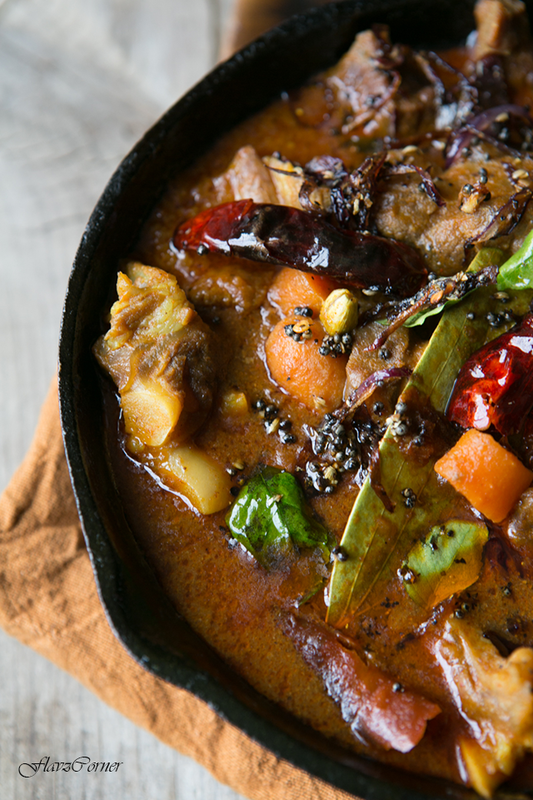 Good young goat meat makes a big difference in this curry. I missed the Friday Food :). I will hop over for the next one. Super Clicks and Recipe! First time here and fallen in love with you space! Good to connect with you! Thanks Mythreyi for the visit and the comment! I am drooling at that curry... love that you have added caramelized onions, would take the gravy to the next level... Mutton is loved in our home by the men, but definitely not with the kids, they prefer chicken any time! Thanks Rafeeda!! Yes, the caramelized onion paste had made this curry special and I keep then ready to use in my freezer all the time, so it makes things easier on my side to prepare curries like this. Our kids also prefer chicken over beef/mutton. Hey Shibi, on your blog after long time. This curry looks so fab, and the neat photography makes me even more tempting! Nice to see you here after a long time!! I am glad that you liked the photographs. I am game for that dish. Love mutton curry any way and this looks super spicy! Thanks Kankana! 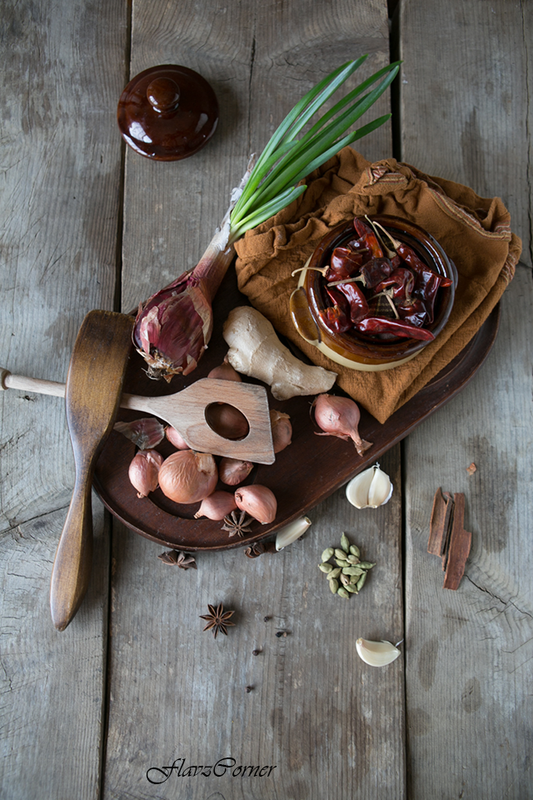 Its a spicy curry that can go well with rice or Naan/rotis. I love curries like this. I have a big thing for south Indian curries, so special and unique. This with aapam would be amazing. I was looking at the ingredients, pretty much similar to one of the dishes I make, except I don't add carrot, will do it next time. Thanks Asha! This curry can go well with appam, just like how we South Indians like. Please do try and let me know how you like it. That curry sounds gorgeous and your clicks are beautiful. Pinning it right away.